Cash buyers: Who are they and how come there’s so many of them? If they only accounted for about a fifth of the market or so, as was typically the case, it may not be so much of an issue, but figures show that more than five in every 10 purchases in the residential property market is by a cash buyer. …Before the crash, cash buyers appeared to be in more scarce supply. Figures from the Central Bank show that at the pinnacle of the boom in 2006, cash buyers accounted for about 25 per cent of the 151,000 or so annual transactions. Back in 2000, there were about 28,000 cash sales out of a total of about 102,000 or about 27 per cent. …“It’s a bit bouncy from quarter to quarter, but on a four-quarter moving average basis, you can see that it is gradually tapering, very very slowly,” says John McCartney, director of research at Savills. From that high of 63 per cent in 2013, the proportion has most recently dropped to about 53 per cent. …Last year, some 89 per cent of investors bought entirely with cash according to Savills figures, “and if you went outside Dublin it would probably be even higher”, McCartney says. …But what about all the investors who we hear are leaving the market due to the stringent costs of running a rental property? McCartney doesn’t beat about the bush on this. “It’s a load of crap,” he says, adding that such a line was “self-serving” and was put out there to “effectively lobby the government against rent caps” – which didn’t work. …Savills figures show that, in the second quarter of 2017, some 11 per cent of cash buyers were first-time purchasers. Lowe has observed that more parents buy properties for their children to live in while they attend college in towns and cities around the State, while others may be cash-rich returning emigrants. An interesting article on the cash buyer phenomena in Ireland. Some stats to backup the previously largely anecdotal evidence though this is mainly from just 1 EA. But one things for sure, there’s still an awful lot of cash out there despite the record crash this country went through. Interesting… Cash buyers buying investment properties seems bizarre given the taxation regime on rental income unless of course they’re cash rich but income poor and would not be taxed at the marginal rate, i.e. retired or semi retired. Could also be a trend amongst wealthier families to buy properties for children for college years given the current rental mess. The big question I’d have is whether institutional investors would be considered cash buyers and if this is accounted for in the data? Would like to see the foreign, non-REIT element of this. Chinese flooded Oz, NZ & Canada to get money out of government reach. UK was also a target. To get a visa in the UK, they had to invest something like a million which was then doubled. The number of UK visa applications by wealthy foreigners has collapsed after the government doubled the required investment threshold from £1m to £2m late last year. In the first nine months of 2015, there were just 136 applications for “tier one” investor visas, for which residents from outside the European Economic Area and Switzerland can apply provided they have access to at least £2m in investment funds. This compares with 780 applications over the same period last year, an 83% decrease"
Ireland was the next target as it was cheaper and in the EU. We also upped the amount but it’s small fry compared to UK. Ireland’s Immigrant Investor Scheme saw a massive 500pc spike in applications last year, driven by a surge in demand from Chinese nationals. In order to be considered investors have a choice of investment options: €1m in an Immigrant Investor Bond, at 0pc interest rate; €500,000 in an Irish enterprise for three years; €500,000 in an approved fund; a minimum investment of €2m in an Irish Real Estate Investment Trust; investment in a residential property of a minimum value of €450,000 and a straight investment of €500,000 into the immigrant investor bond - or a €500,000 philanthropic donation or endowment." Buy property in a pension. 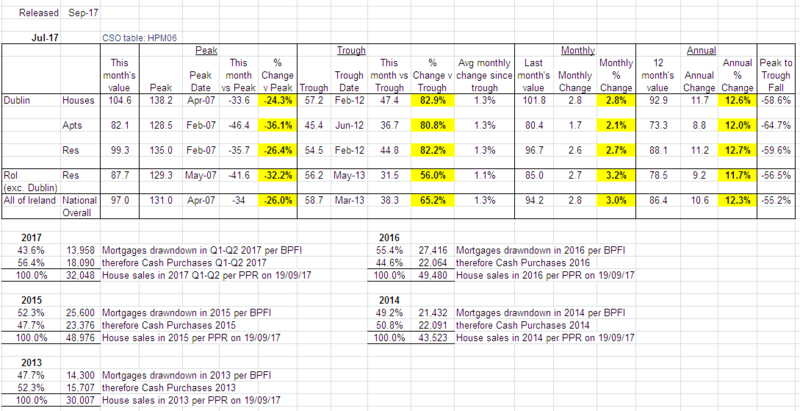 We went from 55% cash & 45% mortgages in 2013/14 to 37% cash & 63% mortgages Q4 2016. A function of rising prices and increased lending activity. Does anyone know, if someone borrows from abroad, does that get recorded here ? I’d presume if the loan is secured on a particular property * it has to be done via a regulated financial entity and would be but if a fund/HNWI borrows abroad for general [company] funding it wouldn’t be? The research shows about 61 per cent of privately-rented properties are owned outright by their landlords, up by almost 20 per cent since 2012. This means that just 39 per cent of rented properties have mortgages on them, down by 23,192 properties since 2012 – and 8,000 properties became mortgage-free in the last year alone. This means there is a limit on the ability of the Central Bank’s lending rules to control property prices, a study by an economist has found. …Central Bank economist Mr Gaffney found that the lending limits have less impact on modestly priced houses where cash buyers are prevalent. The Central Bank restrictions are biting also at the lower end of the market: an Estate Agent’s Index shows no price increases for 3-bed Semis during Q4 2018 in about half of all areas in Ireland. Overall, the average house price across the country rose by 4.6pc in 2018 - indicating that the market is continuing to steady after an 11.3pc overall rise in 2017. Overall the price of a three-bed semi-detached house in Dublin city has increased by just 1.6pc in the last 12 months as the Central Bank’s borrowing rules increasingly define affordability in the housing market. Does the Indo congratulate the Central Bank on taking the steam out of the property market and keeping house prices within reach? This is an end-of-year paralysis caused by an artificially created slowdown in mortgage lending, particularly as people tend to wait for the new year and a new chance at exemptions to strict lending rules. But it doesn’t occur to the Indo that the banks should simply spread these exemptions over the full year. In holiday home areas, such as Killarney and Bantry, buyers over €500,000 are hedging their bets on a rise in sterling if there is no hard Brexit, which could give them a 15pc increase in value.